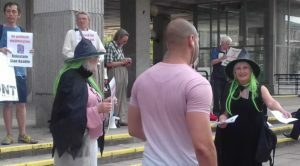 Around 30 people attended LAW’s lobby of Hammersmith and City council’s meeting on July 16. Stan was sacked from his job at the council for saying that the Zionist movement collaborated with the Nazi regime – a well documented if shameful historical fact. He said this on March 26, in a conversation in Parliament Square. This had nothing to do with work. 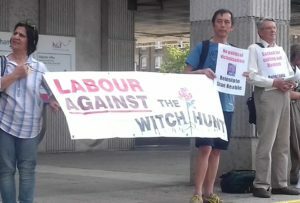 Stan was participating in the Jewish Voice for Labour counter-demonstration in support of Jeremy Corbyn and the Labour Party, called in opposition to the right-wing ‘Enough is Enough’ demonstration. The conversation was secretly filmed by the BBC’s David Grossman, who put a 105-second video clip online. This dismissal extends the McCarthyite witch-hunt against Corbyn supporters in the Labour Party to the area of employment. We fear that Stan’s dismissal could be the first of many political sackings. More details on Stan’s case are available here and a model motion is here. 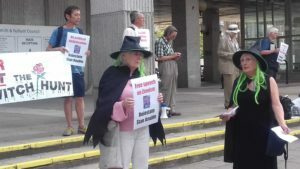 As his union is refusing to support him, Stan will have to pay for legal advice himself, which is why we ask you to support his crowdfunding campaign.